We created a garden outside. The children began looking for fairies after we read the book, The Tiptoe Guide to Tracking Fairies. The children began talking about the fairies and looking for fairies in our garden. block area because fairies like music. They began to become frustrated because the fairies had not found our room. One child came up with the idea that we would have to catch the fairies and bring them to the house. 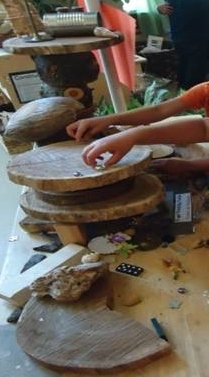 The children took the idea and discussed different ways to catch the fairies. One idea was to make a trap. They sketched their ideas. One idea was a box with food in it . Another idea was a net and we could sneak up on them and throw the net over them. We created a net with yarn. We searched for the fairies everyday but they eluded capture. Through the idea of the net another child said, "We need something they like." We kept discussing different ideas. I brought in an embroidery hoop and asked "How can we use this to catch the fairies?" The children still liked the net idea. We wrapped rope around the hoop. We took it outside to the garden. The children found grass and flowers to put on the loom. 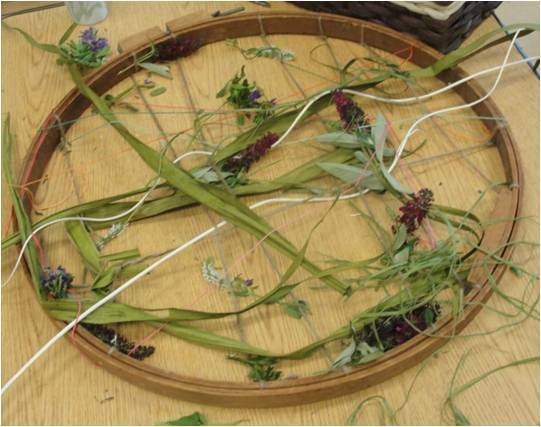 We brought it in and they finished weaving the flowers and grass into the hoop. We discussed how the hoop would catch the fairies. The children thought we should put it outside and leave it over night. One child said, "They will fly into the hoop because it's pretty." We placed the hoop in the garden. The children checked the hoop everyday but no fairies. Finally, I posed the question, "Do you think it is very nice to trap and trick the fairies?" Several children shook their heads. I asked, "What do we do in class when we want a friend to play with us?" One child said, "Ask them." I said, "How could we ask the fairies to come play with us?" Some replies were, "We can yell in the garden. We can ask them nicely. We can write to them." Teacher asked, "What would we write." The children wrote different letters over the week and left them in the garden. The next week we came into the room and there was fairy dust all around the fairy house. The children became excited. They said, "Fairies Came." Teacher asked, "How do you know it was fairies?" The children pointed and said, "Fairy dust." We discussed if the notes were helping. The children shook their heads yes. They discussed ideas about how they could show the fairies that our classroom was safe and we wanted them there. 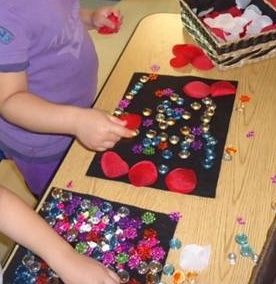 One child said, "Invite them to a party." The children set a date and wrote invitations to the fairies to come to our party. The children planned a party. On the day of the party, guess who showed up? Fairies!!!! 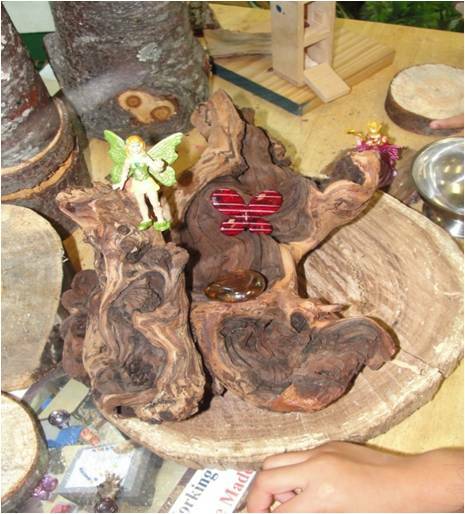 The children played with the fairies for several months. The question the teachers discussed though out the process was how many realistic things to introduce into their play. We wanted them to use their imagination. 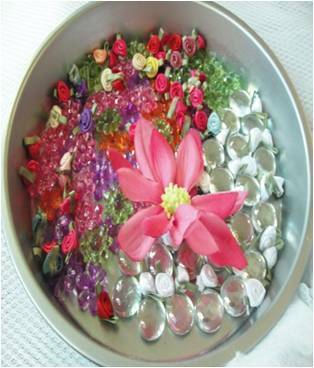 What concepts were the children trying to figure out during the process? Did the children understand that tricking the fairies was unkind and how they changed their techniques when that did not work.